(Reuters) - Bain Capital and CVC Capital Partners are among the private equity firms competing to acquire Papa John's International Inc (PZZA.O), the world's third-largest pizza delivery company, people familiar with the matter said on Tuesday. The buyout interest in Papa John's comes amid a battle for control with its founder John Schnatter, who owns about 30 percent of the company. He resigned as chairman in July following reports that he had used a racial slur on a media training conference call. Since then, Schnatter has been seeking ways to regain influence, and asked Papa John's in a letter this month to amend a poison pill provision it has adopted so that he can engage with bidders that had expressed interest in speaking to him. 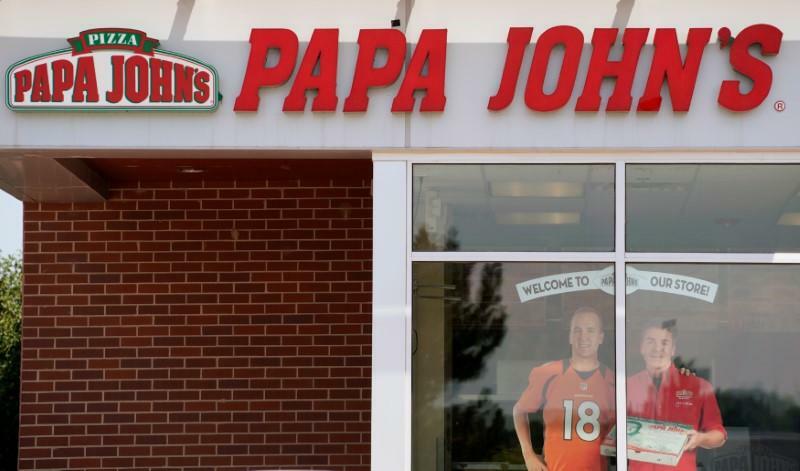 Private equity firms KKR & Co Inc (KKR.N) and Roark Capital have also been vying for Papa John's, with binding offers expected in the next few weeks, the sources said. Hedge fund Trian Fund Management LP, an investor in fast-food chain Wendy's Co (WEN.O) that had expressed interest in Papa John's, is considering a potential investment in Papa John's should a deal for the sale of the company fail to be reached, the sources added. A special committee formed by Papa John's board of directors is exploring a sale as part of a wide review of strategic alternatives, and there is no certainty that the company will agree to a sale, according to the sources, who asked not to be identified because the matter is confidential. Papa John's, Bain, CVC, KKR and Roark declined to comment, while Trian did not immediately respond to a request for comment. Papa John's shares rose 9.3 percent to $53.41 on the news, giving the company a market capitalisation of $1.7 billion. They have lost a fifth of their value over the last 12 months amid uncertainty over the company's business prospects. In August, Papa John’s posted a second-quarter comparable sales decline of 6.1 percent and cut its sales forecast, citing fallout from the company’s split with Schnatter.